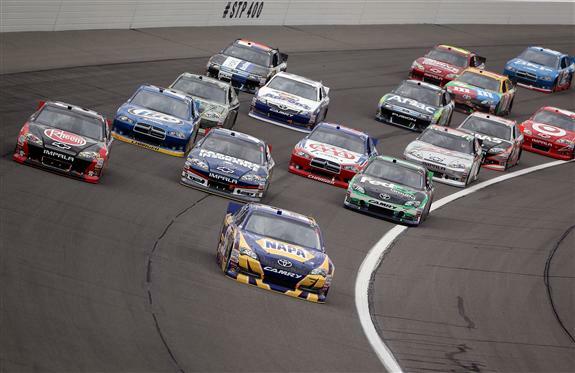 Completing back-to-back on 1.5-mile ovals, the 2012 NASCAR Sprint Cup Series transitioned from the Saturday night Texas Motor Speedway event to the Sunday afternoon day on the Kansas Speedway. The 8th race in the NASCAR Sprint Cup Series, Greg Biffle has shown early race championship form leading the points heading in the STP 400. Noteworthy in the Sprint Cup driver's points standings was the effort of Michael Waltrip Racing's Martin Truex Jr who has installed himself into the tight top-5 battle after 7 races. 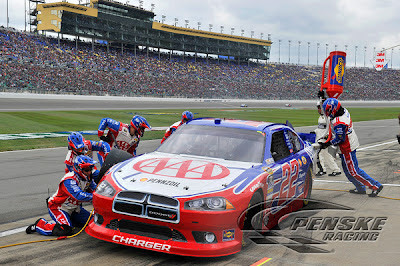 The Penske Racing #22 Dodge of AJ Allmendinger led the 43-car field to the green flag at Kansas Speedway controlling the event with the lead for the first 44 laps until the first round of pit stops under green. After two laps where the #11 of Denny Hamlin and the #99 of Carl Edwards collected a point for leading a lap, the leader of the STP 400 was the #56 Toyota of Martin Truex Jr. While the race's first yellow flag flew for the #15 car of Clint Bowyer spinning as he attempted to enter pit lane, none of the lead pack of stock cars decided to pit during the break in the racing action. When the green flag was thrown, Truex Jr rocketed away as he asserted himself as a dominate force with his Michael Waltrip Racing car. Similar to the previous Texas Motor Speedway race, the 400-mile event at Kansas Speedway would only see 18 laps of caution as the yellow flag became a rarely-seen sight during the STP 400. Despite the great positioning, the pole-sitting car and driver would incur a mechanical issue shortly after the race's restart robbing the #22 Penske Racing team of a top finish. On lap 60, Allmendinger reported an engine problem that would be associated with his car falling 1.3 seconds off the pace with the stock car field. The #22 car circulated slowly until the a caution for debris on lap 133. Requiring a change to the electronic fuel injection's ECU, mechanics were able to return Allmendinger to the race track to finish the STP 400. The #22 Dodge finished the race in 32nd place ultimately 10 laps down to the leader. The driver of the #22 Dodge for Penske Racing last season before a dramatic removal from the team after the season finale at Homestead, Kurt Busch had a strong run for much of the Kansas Speedway race for Phoenix Racing. Starting 14th, Kurt Busch had has #51 Chevrolet in the top-10 for much of the STP 400. However, a power loss from his Hendrick Motorsports engine dropped him to finish 17th in the event. With trouble plaguing the customer of Hendrick Motorsports' engines, one of the race operation's immediate teams suffered turmoil. 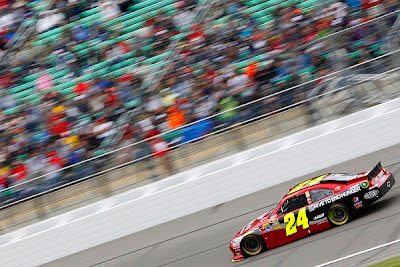 In position for a steady top-10 finish, inaugural NASCAR Cup series winner at the Kansas Speedway Jeff Gordon suffered late-race engine woes. Wounded, the #24 car did finish the STP 400 three laps down in 21st spot. “We lucked out in some ways, I feel like, by finishing 21st. It could have been a lot worse. We struggled today. We missed the set-up. And we were still going to finish 7th or 8th. So I think that says a lot about our race team. But yeah, we obviously had a valve spring I believe, something in the valve train that broke." commented Jeff Gordon, driver of the #24 Chevrolet. 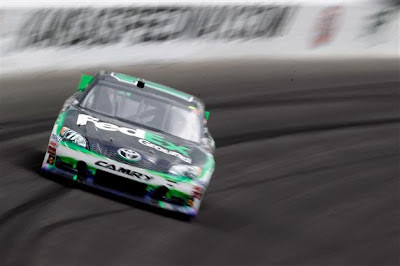 Leading 173 laps up to the 236th circuit around the Kansas Speedway, Martin Truex Jr had held off all comers with exception of Joe Gibbs Racing's #11 Toyota piloted by Denny Hamlin. Capitalizing on less than ideal set of tires that Truex Jr reported through his last race stint, Hamlin reeled in the #56 car and stole the lead on lap 237 (Reminiscent of the moment where Biffle past Johnson at Texas 8 days before). While Denny Hamlin claimed the lead, Martin Truex Jr fought hard to position himself for a late race fight for the race win. With three laps remaining, the #56 Toyota stormed through turn 3 underneath the #11 car but lacked speed through turn four. Well in control of car, the move was Truex Jr's most ambitious attempt at a second-career NASCAR Sprint Cup Series win. Despite great efforts of the #56 Michael Waltrip Racing car, Denny Hamlin had the edge at the end of 267 laps to win the STP 400. 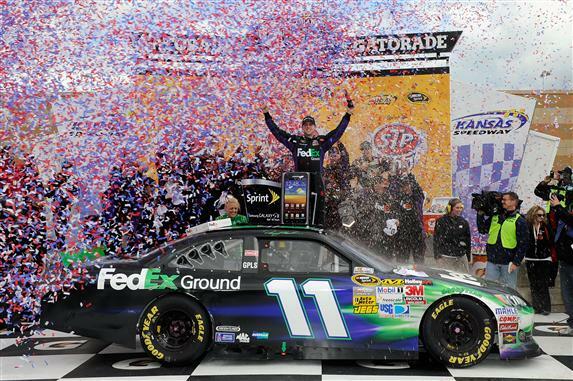 A 2nd win for the #11 Joe Gibbs Racing Toyota and driver Denny Hamlin early in this 2012 season, the victory at Kansas Speedway was the first for the Toyota car make. As Martin Truex jr came across the finish line second, the Japanese brand took the top-two positions after 400 miles combining to lead 205 of the race's 267 laps. While Martin Truex Jr came the closest ever for a win with Michael Waltrip Racing, his team cars suffered engine troubles. Clint Bowyer's #15 Toyota was parked after just 125 laps in the 267-lap event while the #55 Aaron's car driven by Mark Martin was forced out of the race with only a handful of laps to go foiling a top-10 run. Michael Waltrip Racing affiliate JTG Daughterty Racing also saw their #47 Toyota piloted by Bobby Labonte suffer a dramatic engine blow-up during the STP 400's second caution period. For the second 1.5-mile track in a row, the #48 Hendrick Motorsports Chevrolet appeared to be in position for the 200th win for his car owner. Into the late stage of the STP 400, it appeared that Jimmie Johnson was in position to spoil the battle between the Toyotas at the front. While fast on many occasions, the #48 Chevrolet was never able to mount a solid challenge on the #11 or #56 Toyota. "Just wish we had a little bit more today, and be in victory lane.” said Jimmie Johnson still searching for his first victory of 2012. Despite missing out on victory, the STP 400 did produce top-10 race results for 3 of Hendrick Motorsports' Chevrolets. Behind Johnson's 3rd place, the #88 car of Dale Earnhardt Jr finished 7th and Kasey Kahne completed a second-straight event in the top-10 with an 8th. Roush Fenway Racing had a solid outing as the Ford of Matt Kenseth finished 4th ahead of NASCAR Sprint Cup point leader and teammate Greg Biffle. The #99 Ford of Carl Edwards rallied from 21st to 9th over the 400-mile event. Next for the 2012 NASCAR Sprint Cup Series is a Saturday night event at the 3/4-mile short track of Richmond International Raceway.